Cecil Coles was born in Kikcudbright, 7th October 1888. Educated at the George Watson School in Edinburgh, he won a scholarship to the London College of Music. He became friends with Gustav Holst at the Morley College Orchestra. He then went back to Scotland, studying at Edinburgh University, then won a composition scholarship to the Stuttgart Conservatory. He was appointed assistant conductor at Stuttgart Royal Opera. He returned to the UK before the first world war broke out, joining the Queen Victoria Rifles. When the war did start he was immediately called into action on the Western Front. Even here he tried to continue composing, sending manuscripts back to Gustav Holst, even when shelling destroyed his musical instruments and some of his manuscripts. Holst presumed that 2 movements of his Behind the Lines were also destroyed by shelling. Eventually though his luck ran out. 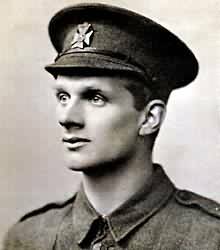 He was heroically retrieving wounded from the battlefield when he was killed by a German sniper near the Somme. It was the 26th April 1918, and the young composer was only 29. He was buried in Crouy in Picardy, France. After many years, the family of Coles rediscovered their father’s ‘lost’ manuscripts, still bloodied and shrapnelled, and it was eventually performed by the BBC SSO under Martyn Brabbins. His music was used fittingly for the opening and closing credits for the documentary The First World War shown on Channel 4 in 2003. You are currently browsing the archives for the Cecil Coles category.